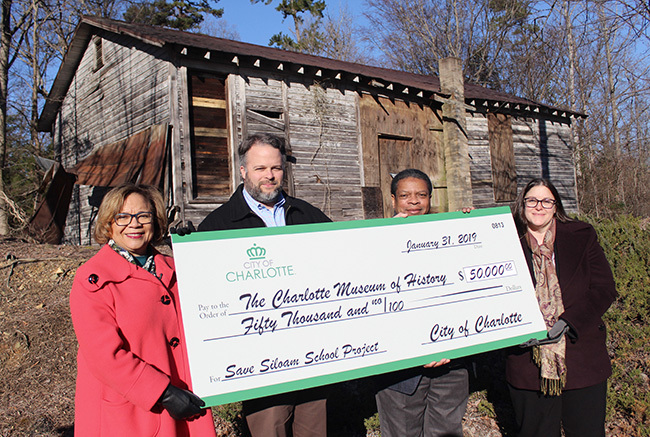 On Thursday morning, Mayor Vi Lyles and other city leaders joined Adria Focht, executive director of the Charlotte Museum of History, in front of the Siloam School, a historic school built for black children in the 1920s, to announce that the city will contribute $50,000 toward moving and renovating the building. The school will be moved from its original location on Mallard Highlands Drive behind the Mallard Glen apartments in University City to the Charlotte Museum of History in east Charlotte. While Focht is still seeking a confirmed appraisal on how much the move and future upkeep will cost, she said it could be between $600,000 to $800,000. “What we have maintained as part of the fundraising project from the beginning is that we’re not just going to move the structure; we’re not just going to move it and preserve it; we’re not just going to move it, preserve it and put an exhibit in it; we’re going to move it, preserve it, put an exhibit in it and have the funding in place to continue to maintain it for the near future,” she said. On Thursday morning, Lyles said the Siloam School will serve as an opportunity to bring historical exclusion into conversations about race and opportunity in Charlotte. Also on hand Thursday morning were city council members Greg Phipps and Larken Egleston. The two were the strongest advocates to help fund the Siloam School project. Phipps represents District 4, where the school currently stands, and Egleston represents District 1, where the museum is. Phipps said the project was a “no-brainer” from the moment the museum’s former executive director Kay Peninger approached him about it. Egleston, who ran for city council on a platform that included a heavy focus on historic preservation and adaptive reuse, said the move will put the structure in “able hands” to tell the school’s story more effectively. Though it’s unclear exactly what year the Siloam School opened, attendance budget records exist for the 1922-23 school year. 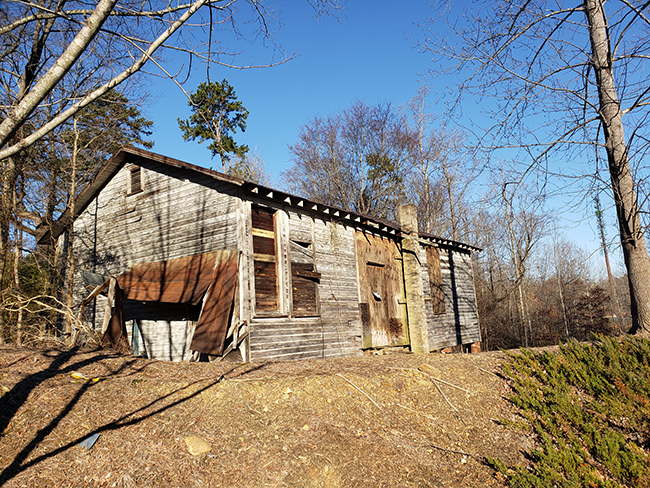 According to the Charlotte-Mecklenburg Historic Landmarks Commission, former students have said the school was built in the early ’20s to replace a log cabin schoolhouse built there earlier in the 20th century. The Siloam School was built amid a movement to educate freed blacks that began in the 1890s and continued into the 20th century. The Rosenwald Fund, a partnership between Booker T. Washington and Sears Roebuck tycoon Julius Rosenwald, helped fund construction of more than 5,000 schools for African-American children in the South. Although the Siloam School wasn’t build with Rosenwald funding — it’s believed a nearby church funded its construction — it was designed after the Rosenwald model. During the Jim Crow era, Mecklenburg County was home to 26 Rosenwald schools, more than any other county in America, according to the Charlotte Museum of History. The Siloam School is one of the last Rosenwald schools still standing in Mecklenburg. Focht said she hopes the city’s funding will kickstart the Siloam School project after months of “spinning wheels” on what to do next. What do you do when you’re stuck between the father you love and the mob boss you’d love to be? When Bobby Deniro’s involved, that should be an easy decision, but he’s not starring in this version of a timeless tale, so we’ll have to see. $25 and up. Modernism in the Mountains Knight Theater 430 S. Tryon St.
What do Albert Einstein, John Cage and a Bauhaus double-wide trailer on steroids have in common? Black Mountain College, an experimental institution in Asheville that once flourished where the LEAF Festival now takes place. A panel discussion at Knight will be followed by a reception at Bechtler Museum at Modern Art. $25. Digital Gardens Art & Music Celebration Shed Ampitheater at Station House 4100 Raleigh St.
Can’t make it to the Electric Daisy Carnival? No worries, Charlotte is home to the second annual Digital Gardens Music and Arts Festival in NoDa, complete with a killer lineup of EDM artists, trippy installments and vendors. $55-165. What better time than 4/20 to blaze one before you stroll around Symphony Park and look at the beautiful glowing lanterns floating in the water. Sure, this is a family event, but it’s weed we’re talking about here, not meth for God’s sake. $35-40. Chris DeMakes, cofrontman of Florida-based ska-punkers Less Than Jake, recently referred to his band as “the cockroaches of the music industry,” as they’ve outlived all their musical peers that began in the late ’90s. We see a ska renassaince brewing on the horizon, so who better to ring that in? $23.50. Lincka, Emily Sage, Sidenote Petra's 1919 Commonwealth Ave.
For a night at Petra’s, experience the music of a woman who grew up in Portugal, a creative Charlotte rapper-poet-singer-dancer and the bilingual lyrics of Mexican-American musician Lincka. You’d be hard pressed to find a show in the Queen City with this much musical and cultural diversity. $7. Bushels of pollen are falling from the trees and half the people we know are befuddled by inflamed sinus agony. What better time for New Jersey emo band Misery Loves Company to come blowing into town? It’s empathy at maximum volume. $7. Bark in the Ballpark BB&T Ballpark 324 S. Mint St.
Can’t stand to leave your fur baby at home while you run off to the ballgame? Well, for four games this season, you can bring the pup you love with you while you watch the Charlotte Knights. Just make sure they don’t try to play fetch with a fly ball. $9 and up.